Do you have more energy or do you feel more physically drained during this time of year? Do you complain more during this time of the year? Do you look forward to the attending gatherings with friends and family? Do you look forward to creating gatherings with friends and family? 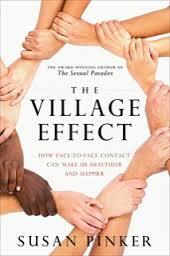 The Village Effect is a book by Susan Pinker that explains very clearly the positive effects you will gain when you clean up your life, build relationships that are both broad and deep, and stop waiting and making excuses why your life is not the way you want it to be. People matter. You matter. While you are busy decorating your house for the season, take a honest look at ‘cleaning’ your house of relationships. The time you invest will not be wasted and the result just may be a gift that extends your life in a positive way. One word of caution, the chapter that discusses health, cancer and positive thinking may be upsetting. I urge you to read what the science is really saying and to remember regardless of whether you can be cured of an illness, you can still have a better day when you create positive emotions. Don’t Die Waiting to live the Don’t Die spirit!